A Quinnipiac poll has found that New York residents really like their teachers but those teachers’ unions have got to go. The poll showed that 50% of New Yorkers had a favorable opinion of public school teachers as opposed to 22% with an unfavorable opinion. But when it came to clapping for the teachers’ unions, well, that applause was much more muted. 51% of the respondents felt that unions played a negative role in education as compared to 39% who felt that unions had a positive role to play in the teaching of New York’s public school kids. And when it comes to layoffs, the overwhelming majority of New Yorkers believe that any teacher cuts that need to be made should be based on performance and not on seniority. A whopping 85% of respondents favored performance as the layoff criterion. In New York City, Mayor Bloomberg is battling the United Federation of Teachers over their seniority scam. With an estimated 1,000 NYC teachers due for the chop, the issue of performance and its role in the layoff process has become a crucial bone of contention. Despite poll after poll showing that people have had enough of the tired and tainted union tactics, these bozos just won’t get it. They have ignored the growing discontent of taxpayers. 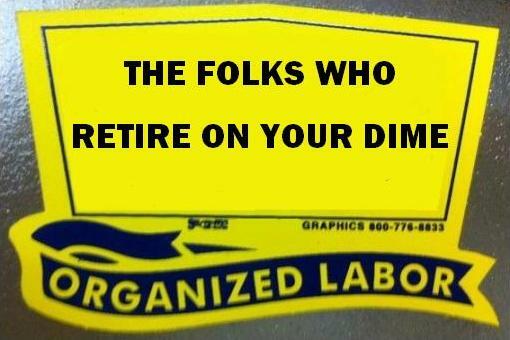 And the more public sector unions dig in their heels, the less popular they become. Their leadership relies on the same old game plan, using ad campaigns, noisy demonstrations, intimidation tactics, and threats. But all their loud huffing and puffing won’t be enough to blow down any state house. Public sector unions have reached a watershed moment in their history. And when all their yelping and howling finally comes to an end, I think they’re going to find themselves minus a few fangs and less able to chomp away at the public hand that feeds them. This entry was posted in Education/Campus, Political/Social and tagged Bloomberg, layoffs, New York, poll, public sector, Quinnipiac, teachers, unions, United Federation of Teachers. Bookmark the permalink.